This is one sweet bean soup. 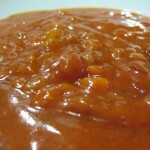 I had a sweet bean soup at the end of a Chinese wedding banquet once that was meant to be sweet–it was the dessert. This soup is needlessly sweet. One serving, which is only half of the tub, has 3 tsp of sugar. Like I said, this is one sweet bean soup. The chile heat cuts through the sweetness but not enough. And where are all the promised beans? 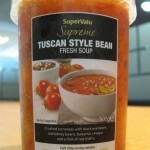 Despite the fact that neither of these beans would be used by Tuscans in their bean soups, I’d like to see a few more in a soup with “bean” in the name. Don’t bother with this soup; make this instead. You’ll be a lot happier.